Henna is an important ingredient for my hair care regime. I've been using Shahnaz Hussain’s Henna Precious Herb Mix for long time and it has never given me a chance to complain. 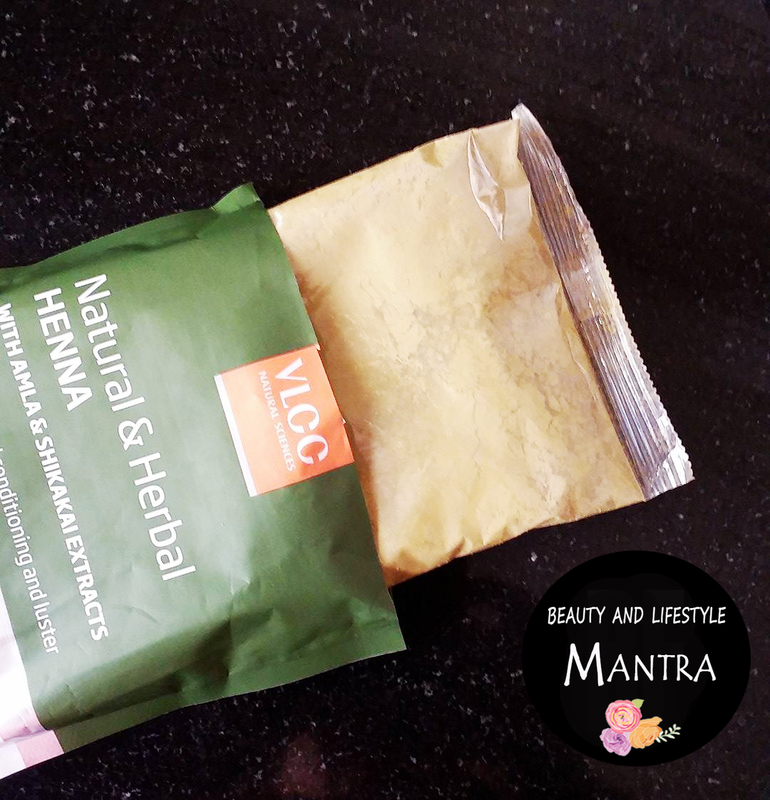 Recently I've tried this VLCC henna which is totally new for me. Usually I use henna for two reasons, one for conditioning and another for the problem of grey hair. Henna works very well for me as a good conditioner and for few days it prevent my hair fall too. 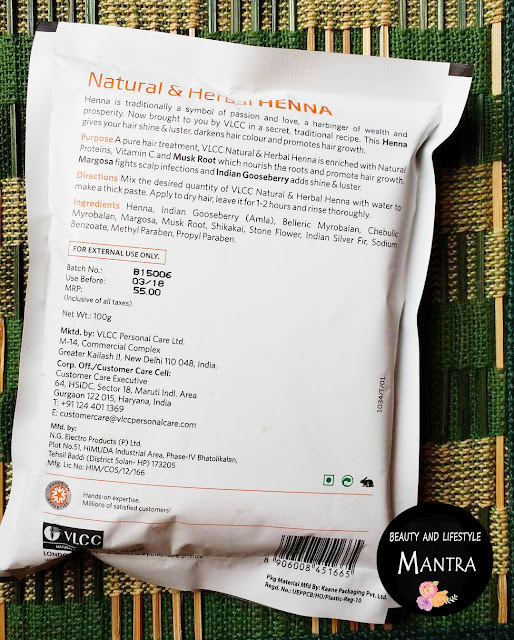 So, today I am going to share my experience with VLCC Natural and Herbal Henna. 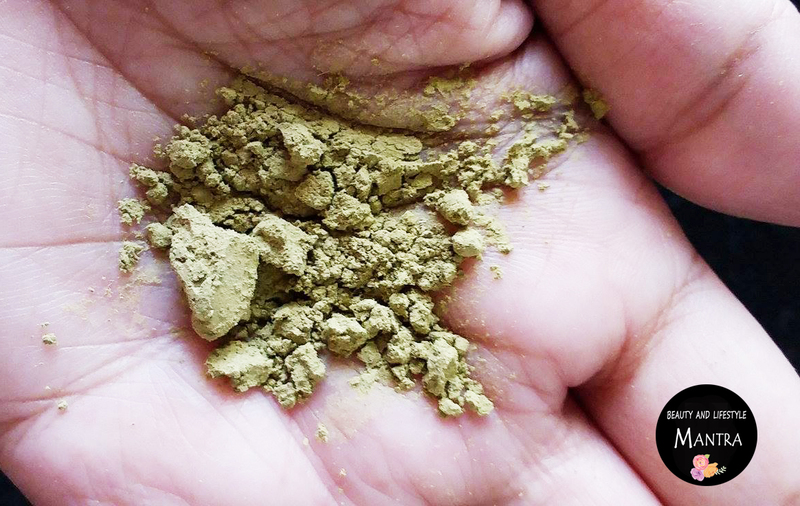 This henna gives your hair shine and luster, darkens hair color and promotes hair growth. Mix the desired quantity of VLCC natural and herbal henna with water to make a thick paste. Apply to dry hair, leave it for 1-2 hours and rinse thoroughly. Henna, Indian Gooseberry, Belleric Myrobalan, Chebulic Myrobalan, Margosa, Musk Root, Shikaksi, Stone Flower, Indian Silver Fir, Sodium Benzoate, Menthy Paraben, propyl Paraben. This henna powder comes in a simple plastic packaging and one transparent plastic packet inside the henna pouch. The powder is fine textured and henna powder is green in color. The smell is not very strong, it’s like dried henna leaves. I generally use three-way Henna. In my previous post where I reviewed Shahnaz Hussain’s Henna Precious Herb Mix I mentioned the three processes. Anyway, this time I took the required quantity in a bowl and mixed with tea liquor and lemon juice to make a paste. I kept this paste on my hair for around one hours and then I washed my hair with plain water so that all the henna is washed away. Then on next day, I oil and shampoo my hair. The results: Frankly speaking after the first use this henna makes my hair soft and shiny. It makes my hair more manageable and smoother than before. But it has not given full color coverage on my hair. I don’t see any significant change on my hair color and my grey hair became little brown which is not on satisfactory level. Overall, from all aspects this is a good product however, I am not satisfied with the hair coloring part as it did not leave any proper color on my hair. Haven't used henna in a long time, seems like this a good one! Thanks for the detailed review. 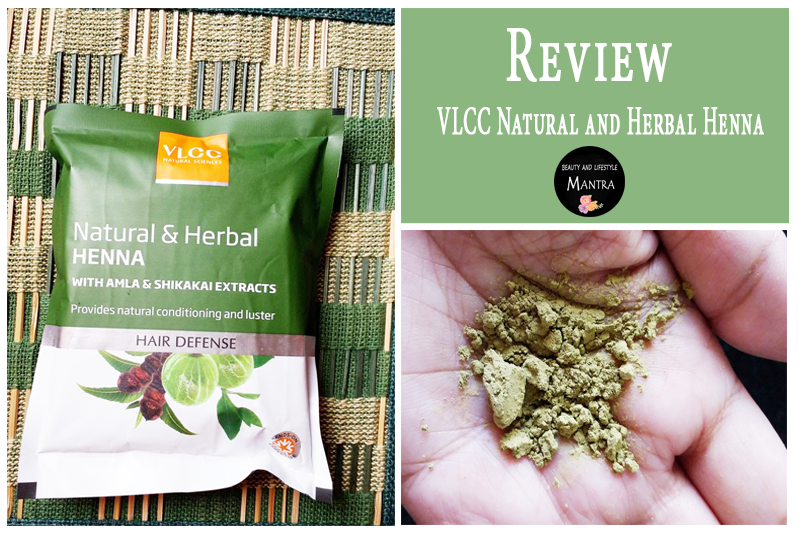 thanks for sharing such a wonderful review about VLCC natural and herbal Henna. you describe it with all the positive and negative aspects of the product. i like the way you creat the content. keep it up! Uh oh. . I bought this one since shehnaz one was not available readily. I use henna mostly for covering my greys. Seems like I am heading towards a disaapointment.